Plumbing is probably the last thing you’d think of when it comes to amazing design. There are plenty of plumbing websites out there that will blow your mind, though. While the goal of a plumbing website isn’t to blow visitors minds, it should be able to meet the goal of ranking the plumber in local search and converting visitors into leads. Those are two things good affordable web design will do. This isn’t just about getting the job done, though. 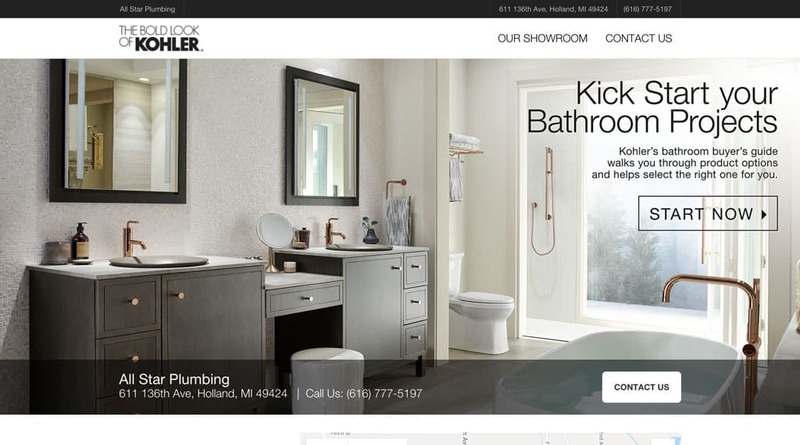 These examples will make you think of plumbing website design in a whole new way. From the sleek to the creative, a plumbing website can be more than just a boring website. There are three categories of websites that I found when researching plumbing websites. Outdated, old, or very little money invested in their website. Decent plumber websites that get the job done, should convert well and works well for modern consumers. Blow your mind plumber websites that look amazing and look like a lot of money was invested in them. These websites are the third category for the most part. Some of them border on the second category but those are built so well for conversion that they deserve a higher rank. Without further ado, it’s time for 10 plumber websites that will blow your mind. Keep in mind they are in no particular ranked order. This one just blew my mind simply from the comedy of the front page. It does look amazing too and the method to communicate with them is great. The tagline “number one in a number two business” is great though. A company that can make its customers laugh is a company that will make a great impression. It also helps that you can call them, request service, and chat with them all with one click. Pretty cool right? 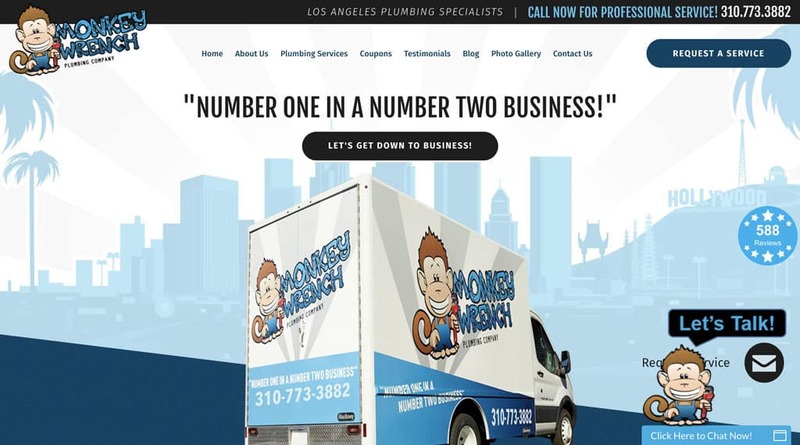 Monkey Wrench Plumbing definitely is representing Los Angeles in a good way when it comes to great plumbing websites. Definitely check out their website and see how they’ve done their company proud with an amazing blow your mind website. The website for Anderson Plumbing is pretty impressive. They’re a local plumber that services San Diego and surrounding cities. Their website not only looks great but it is functional too. That’s important for a plumbing website. There are a few things that make this website extra functional for visitors. Visitors immediately can see if they’re open because it gives them an accurate day and time and then if they’re open. That’s probably one of the most frequent questions of visitors. The next most needed information is how to contact them. They have that taken care of with a phone number available 24/7 for emergencies, etc. Still not enough? It’s easy to request service with an unmissable button to fill out a service request form. There’s also a chat option for those who just want to chat with a live operator. This website is not only great looking but it excels at converting visitors into leads. My only gripe? It’s hard to tell on your first visit that they serve San Diego and other cities. That information is only available in the website title and the contact page. Head over the Anderson Plumbing’s website to check out how amazing it looks. Prepare to have your mind blown. If you don’t say wow when you see this website for the first time then you might want to see a doctor. 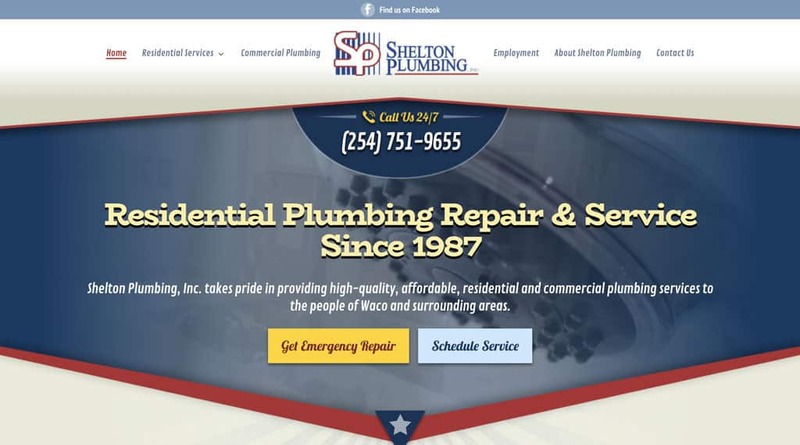 This website is through and through Texas and that makes sense because Shelton Plumbing is just outside of Waco. Just in case the video behind the front section doesn’t impress you, the rest of the website will. It’s pretty impressive and unique too. There are a few things that aren’t working 100% on the website but with those fixed, the website would function spectacularly too. Their website immediately answers two of the biggest needs for visitors, scheduling service and emergency service. I don’t know about you but those are two things I’d want to do! If you only check out one of the plumber websites listed here this is the one to check out. Head over the Shelton Plumbing website to see what they’ve cooked up to make your mind explode with amazement. If you’re in the San Francisco or anywhere in the California Bay Area then you may have run across Cabrillo Plumbing. Their website is unique and looks great. It has that old-timey feel also which gives it a great thorough brand feel. The website makes it easy for visitors to convert with a phone number immediately available and a simple conversion form right up top. It’s pretty slick. One other thing that they do well is through SEO to rank better in local searches. There are many unique local pages with reviews even as far as San Jose. 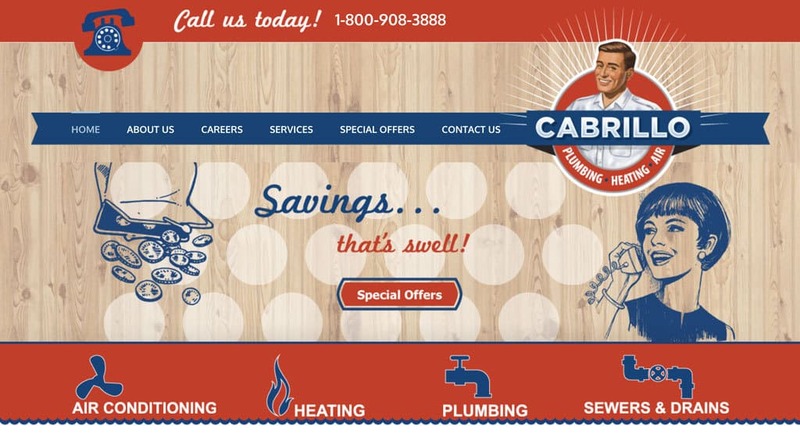 Be sure to check out Cabrillo Plumber’s website and see the unique style and brand they’ve created. The John Moore plumbing website is simple yet effective. Just by visiting their website you can see the John Moore van pulling up ready to get stuff done and of course with the Houston skyline in the background. It’s easy for visitors to call immediately from their phone or fill out a service request through a form. While the form is a bit complex, sometimes people just want the company to contact them rather than the other way around. My only gripe with this website would be that the now hiring button shouldn’t be so in your face. Websites should first and foremost be custom facing with employment opportunities at the bottom. Overall the website is a great plumber website and I would recommend heading over and taking a look at the John Moore Plumbing website. This is another San Diego plumbing company that does their website right. I know, web design isn’t a plumbers trade but does that mean their website shouldn’t represent them? 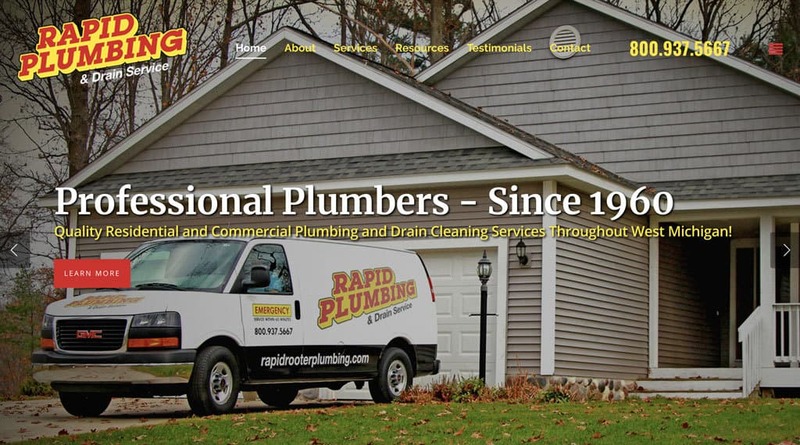 John Padilla Plumbing absolutely gets the importance of representing the company with a great website. It’s not only spectacular looking representing San Diego in a great way but it makes it easy on visitors. Notice how easy it is to see that they serve San Diego? Not only that but to schedule an appointment it’s a simple button click away and the phone number is available right at the top. I don’t quite understand why there’s a search box though, it doesn’t seem to fit. Head over to the John Padilla Plumbing website to see a plumber website done right. All Star Plumbing has done things a bit different than the typical plumber. Their focus is on renovations and doing new custom work rather than fixing the typical plumbing problems and such. So, their website is geared towards bringing people looking for options for what they can do. That means they want to see a showroom and they just so happen to have one! It’s easy to give them a call or even head down to their showroom in Holland, MI. Now for some of the website stuff. This is one of those websites that looks great but maybe won’t blow your mind. It does, however, accomplish its goal well and present their positioning successfully. The website communicates professionalism and the type of work they do. I would recommend heading over and checking out the All Star Plumbing website to see how some plumbers are doing things a bit different. That’s a great way to communicate their unique industry positioning. There’s something very calming about the Lutz Plumbing website. While it’s not to the blow your mind level, it is well done and effective in some ways. I think I may just be partial to the logo which has a calming feeling about it. Each service they provide is simply laid out and easy to learn more about. Not only that but when you click on a service they have it simply laid out for who their client is and what they do. It’s clean, it’s simple. It’s not perfect but it still has many elements of a great website and it’s miles ahead of almost all other plumbing websites. How friendly can you represent a plumbing company? In the case of Rapid Plumbing, pretty darn friendly! The company represents themselves as a friendly, local plumber who lives next door. The photo on the website is very welcoming, the coloring fits it well, and all the right pieces of information stand out. You can easily call them right from the front page (or any page for that matter!) or learn more. There something about the simplicity and the friendliness that makes this plumbing website great. They service Holland and Grand Rapids in Michigan and their website definitely represents them well. I would recommend heading over to Rapid Plumbing’s website and checking out what they’ve done to create that welcoming mood. That’s hard to do for a company! A website doesn’t just have to look amazing, it has to work well with the locale and of course the industry. 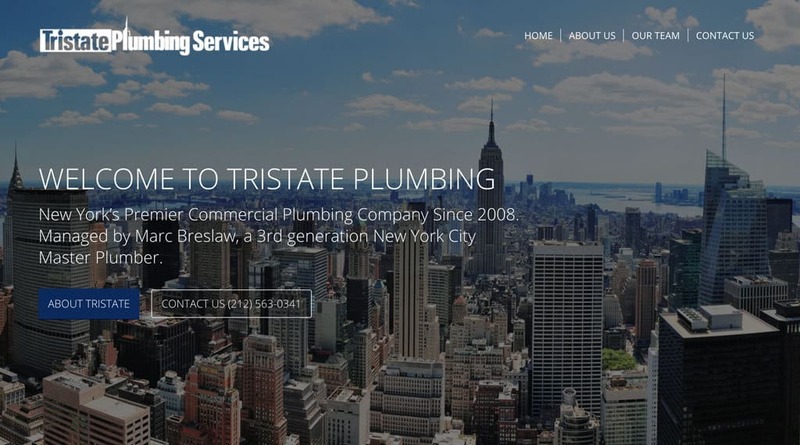 Tristate Plumbing Services has done that representing New York City to the max. Their website is simple and effective to get the job done. People who are looking for plumbing service aren’t wanting to read a novel, they just want the facts. This website does just that while representing New York with some amazing views. Head over to the Tristate Plumbing website to see a plumbing website that doesn’t let you down. That’s it for all the wonderful plumbing websites that will blow your mind. Your website is important not just to tell customers about you. It also sets the stage for trust and confidence and your company. A plumbing website that is clear, concise, and helps visitors do what they need to do with as little friction as possible is an absolute must. 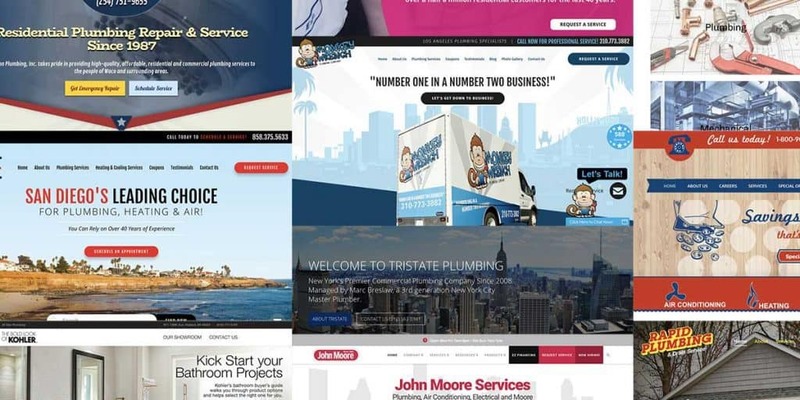 These are some examples of well-done plumbing websites but of course, they don’t all have to blow you away. A website that helps visitors become customers is the main goal. That could mean you invest in custom affordable web design that helps achieve the necessary goals for your plumbing business. Tell customers where you serve. Make it easy to request service. Show and tell about all the services you can perform. If your plumbing website accomplishes these seamlessly across customer’s devices then you’re ahead of the game. If not, you can get a custom affordable website that accomplishes these things and will help your business rank in local searches. these are great plumbing websites! How do i get in contact with who makes them? Thanks for the question! The best way to find out who created all these websites is to contact the owners. There are contact pages with email addresses or contact forms you can use to inquire. I recommend you find the one you like the best (or maybe few) and then contact them. Also, sometimes there’s a link at the bottom of the website to whoever developed it, check there first. Whatever route you go, we wish you luck and are always here to assist you.